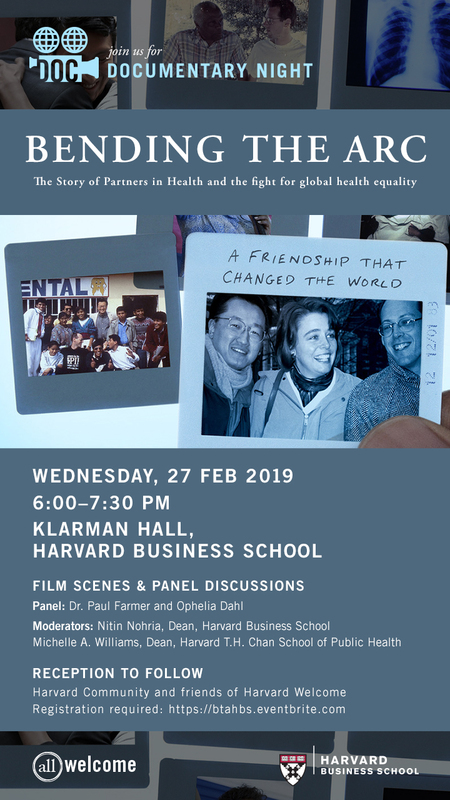 Please join us for the winter installment of Harvard Business School’s Documentary Night, featuring scenes from “Bending the Arc,” the story of Partners in Health Paul Farmer and Ophelia Dahl and their fight for global health equality. A panel of the film’s protagonists will discuss the film and their experiences finding novel ways to address global public health challenges with co-moderators Nitin Nohria, dean of Harvard Business School, and Michelle A. Williams, dean of the Harvard T.H. Chan School of Public Health. This event is free and open to the Harvard community. Partners and friends of Harvard are welcome. Registration required.